I had been emailing with Bob Odom, who informed me that this was more than a tomb, that there were others buried there also. So, I proceeded to do a little research and found the article included on this page. My goal is to at least see each of the cemeteries in Cass, Miami and Howard Counties. So, we drove around searching for "Jack Conner's Tomb" and even hiked a few miles without success. A few days earlier my husband Ed and I talked with a gentleman who turned out to be our guide's paternal grandfather. He told us about the legend and lore of the "tomb." After two unsuccessful attempts to find the "tomb," I contacted Bob to see if he would join us in the hunt. Bob contacted the Scott family who sent Duane to unlock the gates, so that we could drive up the long lane and park near the site. 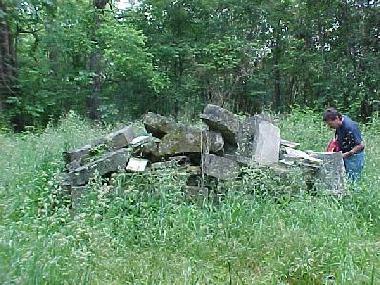 Sunday, June 4, 2000, seven of us were guided to the site of John (Jack) Conner's Tomb by Duane Scott. Duane's family farms some of the land near the cemetery. He is undoubtedly one of a few people who was aware of this cemetery and could lead us to it. Our group consisted of Becky Miller, Ed Beheler, Bob and Pam Odom, and their daughter, Tammy and her husband, Jim and me. Bob grew up in the area and had been to the tomb several times 30+ years ago. The landscape has changed since then. The farmhouse and outbuildings are no longer there. Without those landmarks, finding the cemetery again would be difficult without a guide. The eight of us trekked through nearly waist-high grass to get to the actual site. The following is from Jehu Powell's 1913 History of Cass County, pp. 457 & 474. 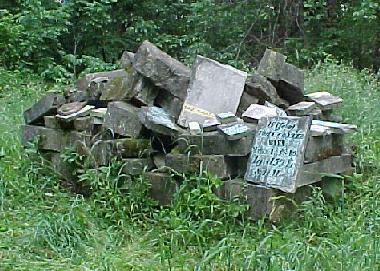 This unique tomb is situated about a mile east of Hoover's crossing and south of the railroad a short distance in a beautiful walnut grove on a knoll surrounded on three sides by a ravine fifty feet deep. The ground was enclosed by a picket wire fence about forty feet square, but the fence has fallen into decay. John Conner was an eccentric Indian trader, the first settler in Adams township, locating here in 1828. He died August 20, 1846, and prior to death gave directions that his coffin be placed in a box, filled with tar and left setting on blocks above ground. His directions were carried out and the thus prepared was left setting in the open air in that beautiful walnut grove where it has peacefully reposed for over sixty-six years. A few years later the neighbors complained and a stone vault was built over the box and coffin containing the remains, a photograph of which appears on another page, showing the appearance of this interesting tomb as it exists today, and his cabin a short distance across the ravine. His wife Elizabeth, who died March 1, 1849, lies buried here; also John Payne 1846; three children of a Mr. Snell, 1851 to 1855; Elijah Conner, June 5, 1848, and his infant in 1840 and a child of John Hoover, 1853. Mrs. Mary M. Harp, whose maiden name was Dillman, now a resident of Logansport, attended this funeral and relates many interesting anecdotes of this most unique character in pioneer days and incidents connected with this most remarkable burial. From Jehu Powell's 1913 History of Cass County, pp. 457 & 474. When the stone vault was built over the box and coffin, instead of using mortar between the stone blocks, lead was used. Neighborhood kids were said to go up there and pick the lead out to make fishing sinkers. The Eel River can be heard from the tomb, so fishing was a popular pasttime. This began the "vandalism" of the tomb. Sometime (not sure of the time period, but after 1913), the tomb was disturbed and some young people were in possession of the skull of John Conner and were carrying it around on the end of a broomstick. 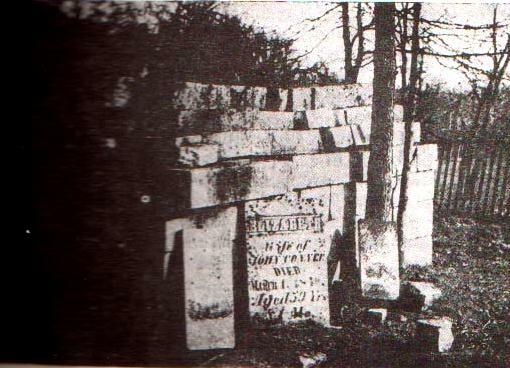 A descendant of John Conner learned of this event and went to the tomb and gathered the remaining bones and buried them in his backyard near an apple tree in the nearby town of Hoover.